America’s Auto Auction also describes Arias as an experienced negotiator, mediator and arbitrator, and he spent many years at Manheim and ADT. He most recently served as Manheim’s director of operational excellence and as director of arbitration. He is currently co-chair of the NAAA Auction Standards and IARA Standards committees. He is also the instructor of the NAAA Standards classes, which take place at various auction locations around the country. Black Book pinpointed the reason why it’s been a brisk start to 2019 in the lanes. Reinforced by the assessment of an auction general manager in the Southeast, Black Book executive vice president of operations Anil Goyal described the current wholesale market situation in the latest Market Insights report released on Tuesday. Editors then shared the latest data, beginning with cars. Volume-weighted, Black Book reported overall car segment values decreased by 0.74 percent last week. In comparison, market values for these had decreased by 0.64 percent on average during the prior four-week period. Among cars, editors pointed out the luxury car and sporty car segments experienced the biggest drops, each sliding by 0.91 percent. Again volume-weighted, Black Book determined overall truck segment values (including pickups, SUVs and vans) softened by 0.75 percent last week. That’s a notable jump from the average editors noticed during the past four weeks, which was 0.53 percent. Within trucks, editors found that sub-compact crossovers sustained the greatest price decline, dropping by 1.65 percent. To wrap up the latest report, Black Book representatives described activity in the lanes from two other places. The National Auto Auction Association said Friday it has promoted Tricia Heon to the new position of chief operating officer. She has served as legislative director and operations manager for eight years. The transition was effective as of Jan. 1. The association also elected Julie Picard vice president for the 2018-2019 term, and she will serve on the executive board with president Chad Bailey and president-elect Laura Taylor. NAAA noted that in addition to its expanding role of the 70-year-old trade organization as a voice for the vehicle remarketing industry, the promotion of Heon to chief operating officer reflects the increasing responsibilities of its administration to serve its growing membership. NAAA now represents more than 340 auction members and 130 associate members. Hackett noted that the title was appropriate for Heon because her job of operations manager had already evolved to encompass much of the chief operating officer’s functions. He added that establishing the new position would prepare the association to handle additional work efficiently without increasing staff as it looks to the future. Also, it will allow him more time to focus on strategic planning as chief executive officer. During her eight years with NAAA, Heon has been responsible for the creation of its political action committee, the annual Day On The Hill advocacy event in Washington, D.C., and the monitoring of federal and state regulations. The association notes that she has been instrumental in the development of projects and initiatives, such as the study to address the technician shortage and reports on the future of the industry, as well as planning meetings and programs. Heon, who graduated from The University at Albany, N.Y., with a bachelor’s degree in economics and political science and earned a master’s in public administration from Syracuse University’s Maxwell School of Citizenship and Public Affairs, worked in local government as a budget analyst and as a consultant projecting the impact of the federal budget on various entities before coming to NAAA. She will continue to serve as NAAA’s legislative director in addition to her new duties of overseeing the staff and the daily operations of the association as chief operating officer. Meanwhile, NAAA elected Picard, who is Manheim’s national west regional vice president, at its 70th annual convention in December. At Manheim, Picard is responsible for developing and implementing strategies for 14 auctions to increase growth, market share, and profitability. Throughout her 26-year Manheim career, Picard served in numerous executive positions, including vice president and general manager of Manheim Pennsylvania, overseeing the auto auction with 1,600 employees and revenues of $226 million. A graduate from the University of Montana with a bachelor’s degree in accounting in 1989, Picard worked for Rhodes and Fullaway, CPA, becoming a senior accountant before leaving three years later to join Manheim Seattle as controller and manager of finance and administration. After completing the Cox Executive Leadership Program, she was named the Seattle auto auction's assistant general manager in 2000, then general manager in 2007 and market vice president in 2011. Picard served as vice president and general manager of Manheim Pennsylvania from January 2014 until being named to her current position in December 2015. 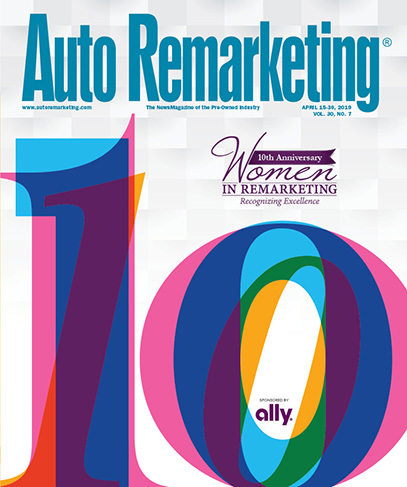 She was honored as one of Auto Remarketing’s 2013 Women in Remarketing. She also received the 2013 Laurie Dobberphul Top Achiever Award, presented by GE Remarketing. It’s already been an eventful 2019 for the XLerate Group. The auction company announced a pair of acquisitions on Friday, adding Morton Auto Auction (MAA) located in Morton, Ill., and Southeastern Auto Auction (SEAA) based in Savannah, Ga.
With these acquisitions in the portfolio, XLerate Group now operates 12 auctions with sales in California, Florida, Georgia, Illinois, Michigan, Pennsylvania, South Carolina, Texas and Wisconsin. XLerate also operates robust digital and mobile sales platforms nationally. MAA has been owned and operated by the Krupa family since 2006, serving both dealers and fleet/lease consignors. In existence since 1978, MAA is XLerate’s fifth Midwestern location and has served a broad swath of dealers in Illinois, Iowa, Wisconsin, Missouri and Indiana as well as key commercial consignors. XLerate chief executive officer Cam Hitchcock said, “Adding MAA to the XLerate family helps solidify our Midwest footprint and adds another highly respected independent operator to our management team. We have stayed the course with XLerate ’s long-term strategy to grow our business, footprint and service offerings by acquiring high-quality independent sales with strong operating management and building upon this foundation. The company indicated that Steve Krupa and general manager Shawn Glatz will continue to oversee MAA and will work closely with the XLerate sales teams to drive additional volume through MAA. Steve Krupa added that “we are thrilled to join the XLerate Group. My team and I feel that XLerate’ s resources, expertise and management structure are a perfect fit for Morton and its employees and will help us to better serve our dealers and commercial consignors. “While it is never an easy decision to sell your family auction, it was clear that XLerate was the best fit,” Krupa went on to say. MAA has dealer consignment, fleet/lease and financial institution sales each Wednesday at its 22-acre facility. In a separate transaction, XLerate Group also boosted its footprint in the Southeast. SEAA has dealer consignment, fleet/lease and financial institution sales each Wednesday at its Savannah, Ga., facility as well as a weekly public sale on Thursdays. The auction operates a four-lane arena and reconditioning facility on approximately 15 acres. XLerate alum and current SEAA operator Bill McCready will run SEAA, according to the company. McCready previously served as the assistant general manager of Charleston Auto Auction, another XLerate Group location about 100 miles away from SEAA. XLerate executive vice president Chuck Tapp said, “We are pleased to officially welcome Bill back to the XLerate family. “He is a proven operator with a laser focus on customer service. He has an intimate knowledge of the regional customer base as well as a great track record with commercial consignors," Tapp added about McCready, who was among Auto Remarketing’s annual Remarketing & Used-Car Industry’s 40 Under 40 honorees in 2016. SEAA celebrated 22 years in business back in August. “SEAA’s customers and employees will be well served by the resources and depth of product offerings that come with being part of the XLerate Group. I look forward to expanding SEAA’s base of business and continuing to drive its strategic growth,” McCready said. DeLoach, added, “Danny, Tommy and I are excited for our dealers, institutional clients and our auction family. Joining the XLerate Group gives Southeastern Auto Auction capabilities it did not have as a single auction. “During our thirty-plus years in business, we have had the pleasure of working with so many great people. We all say thank you to everyone who has worked for, or done business with, Southeastern Auto Auction,” DeLoach went on to say. Nick had the chance to share another conversation with Anil Goyal and Jared Kalfus from Black Book during Used Car Week 2018 for a discussion about how the company partners with a variety of other players in the automotive space for the benefit of auctions, dealers and finance companies. Goyal and Kalfus described the collaborative spirit that brings fruitful results. Beginning first with the December Used Vehicle Retention Index, Black Book reported the reading came in at 116.3, dipping slightly from the previous month’s mark of 116.5. December showed the first decline in the index dating back to May. Editors noted that the Used Vehicle Retention Index finished the year up by 1.9 percent compared with 2017. It was the largest year-over-year increase for the Index dating back to 2012, when the index climbed 3.5 percent compared with 2011. “The segments showing the greatest gains and declines in the Index this month were a mix of car and truck segments,” said Anil Goyal, Black Book’s executive vice president of operations. “This is certainly the time of year when we see declines ahead of the spring selling season. The Black Book Used Vehicle Retention Index is calculated using Black Book’s published wholesale average value on 2- to 6-year-old used vehicles, as percent of original typically-equipped MSRP. It is weighted based on registration volume and adjusted for seasonality, vehicle age, mileage and condition. The index dates to January 2005 when Black Book published a benchmark index value of 100.0. During 2008, the index dropped by 14.1 percent while during 2016, the index fell by just 6.4 percent. Black Book’s Market Insights report showed the prices of cars declining more than trucks to begin 2019. “In the first week of the new year, values of used vehicles continued to decline on pace with the trend seen in December. The previous year ended with the lowest depreciation rate in three years,” Goyal said. Volume-weighted, editors noticed that overall car segment values decreased by 0.69 percent last week. In comparison, the market values softened by 0.64 percent on average during the prior four-week period. Among the car segments, Black Book mentioned the full-size car (down 1.10 percent), sub-compact car (down 1.12 percent), and luxury car (down 0.95 percent) segments experienced the biggest price drops. Again volume-weighted, editors determined overall truck segment values (including pickups, SUVs, and vans) dipped by 0.54 percent last week. That’s nearly on par with the previous four week as the market values for these units dipped by 0.55 percent on average. And in the truck segment, Black Book reported that the sub-compact luxury crossover (down 1.10 percent) and full-size luxury crossover/SUV (down 0.80 percent) segments performed the worst. Black Book's report also included anecdotes editors collected from the lanes. The first one came from an auction owner in Pacific Northwest. “Cautious optimism is the theme for me. I believe things will ramp up a bit right away, while slowly gaining momentum. 2019 will be better than last year for used vehicles. The ‘tax season’ feeding frenzy is now more of a myth than a reality,” the owner told Black Book. Editors shared the views from a wholesale buyer in Texas, as well. — Collectibles: Although most enthusiasts are anxiously awaiting the collectible car “super week” that happens in Scottsdale, Ariz., this month, Black Book insisted that observers shouldn’t forget that Mecum is hosting a major auction in Kissimmee, Fla., through Jan. 13. — Recreational Vehicles: As we move further into winter, Black Book indicated RVs are continuing to exhibit typical seasonal behavior. “Both towables and motorized units are down slightly this month, but their rate of decline has slowed,” editors added. — Powersports: Black Book noted that the Powersports market is down as we enter 2019. “Nearly all segments see declines in value, with the off-road bikes taking the biggest hit this month,” editors said. — Medium duty: Black Book closed discussion in this space by stating wholesale prices continue to stabilize as demand grows for units in these segments to satisfy regional delivery and construction needs.